The non-clinical spotlight series exists to shed light on all of the interesting paths that physical therapy professionals have taken. 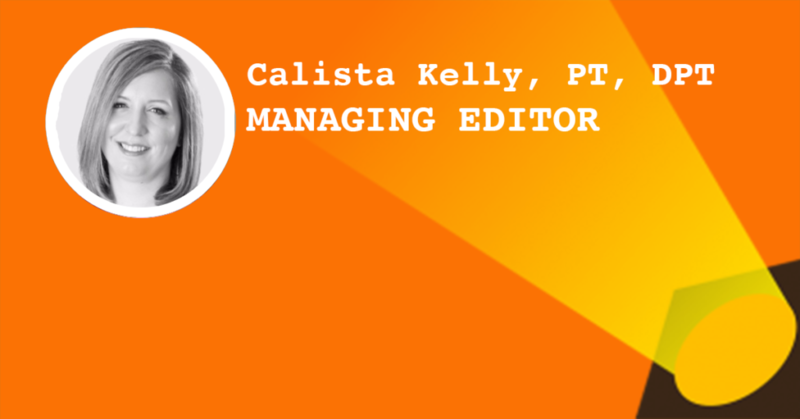 Today’s spotlight focuses on Calista Kelly, PT, DPT who went from PT to Managing Editor at PhysicalTherapy.com. When/where did you graduate from PT school, and how did you practice? I graduated with my Master’s degree from St. Ambrose University in Davenport, Iowa, in 2001. I received my transitional Doctorate in PT in 2007 from the University of Mississippi. I started practicing in acute care and ICU, which was my first love. I left acute care and went to outpatient/sports and later moved to rural Mississippi/Louisiana and worked in an LTACH that had contracts with an SNF, an outpatient facility, home health, and outpatient/sports office. I returned to my home state of Illinois when my husband went back to school, and I worked at a hospital-based outpatient facility until starting my current position. I initially became interested in PT in high school. Early in high school, my grandfather became ill. I spent many days at the hospital during the summer and observed therapists working with him. When I was a senior, I fractured my ankle playing softball. At that time, I was under the care of a PT and ATC. Those two events solidified my passion for physical therapy. I like the ability to play a positive role in someone’s life. As therapists, we may be seeing our patients at one of the most challenging times of their life, but we can assist by listening to them, treating their impairments, and ultimately improving their quality of life. I think most people would say paperwork/documentation is the most frustrating thing about PT. I am not saying it’s something I love, but I understand the need and the purpose. Documentation is part of quality care and proper communication to others who follow our plan of care. To me, the most frustrating thing as a PT is our insurance problem in the United States. Being unable to help someone due to insurance restrictions from high copays and/or limited visits restricts our practice and ability to return patients to their prior level of function or optimal functioning. My career change was a case of right place and right time. I wasn’t necessarily looking for a change out of clinical practice but did have a desire to see what else was out there. Where do you work now? How long have you worked there? I am the managing editor of PhysicalTherapy.com, which provides online continuing education for PTs and PTAs. PhysicalTherapy.com is part of the continued® family, which I joined in 2011. Editor’s note: I’ve been an avid fan of PhysicalTherapy.com since 2010, and wrote a review of them here! How did you find PhysicalTherapy.com as an employer? I had a patient cancellation at work and was reading a professional magazine. I got to the job section and saw a posting. I decided to try it and sent in my CV. My role entails recruiting expert presenters for our site, moderating and coordinating evidence-based live webinars, editing site content, and working with marketing and IT for successful site operation. What’s a day in the life like for you as Managing Editor of physicaltherapy.com? Every day is different! I work from my own home office. I am on the phone, emailing, or in meetings when I am not in webinars. I go to local state (district) physical therapy meetings, CSM and NEXT conferences. Was the job posted somewhere specific? The job was posted in a trade/professional magazine at that time. Now our job openings are listed on our continued.com website. My current position is pretty unique, in my opinion. I didn’t have any professionals in the CE arena that I worked with. Earlier in my career, I worked with several professionals who had the McKenzie credential that led me to want to receive that credential. At the time, I was involved in assisting with local district IPTA events in both planning CEU events and regular meetings. Learning through continuing education has been a passion of mine since graduating PT school. This job opportunity allowed me to combine my love for CE but still network with the PT community and apply my PT knowledge. What steps did you take to land the role? For any job, you should research that company and what you will be doing. I spent some time researching the company, the CE business in general, and the CE approval process. I prepared a long list of questions to ask during the interview process. That not only showed how interested I was in the position but was also important to make sure that the job was the correct fit for me at that stage of my career. For my resume and cover letter, I made sure to include applicable information for this job and why I wanted to work for the company. Pros: Working from home. I work full-time hours with generous PTO. Flexible and works well with family life. I attend all APTA conferences, network with colleagues across the country, and keep up-to-date on all areas of PT. I work with a great team of individuals across the United States. Cons: I am no longer in clinic seeing patients with this job. So to keep up with current happenings, I do a lot of reading and networking with past clinical colleagues. I think the right person has to have a desire for continuing education. They should be a creative, flexible problem-solver who communicates well and is comfortable with promoting and selling. It is exciting to know that the future of PT is learning from our courses that are organized and presented by our expert presenters. We’re making a difference not only in their lives but also in the lives of their patients. We feel everyone should have access to the most recent education and research in the field. Our low price point and online format for continuing education allow that access. There are many jobs that a PT degree can be of use. Education and research are probably the two most well-known. But healthcare management, consulting, and wellness/prevention are examples of other avenues. My advice is to do what you love. Life is too short to worry about what others think. I would first identify if you want to still actively use your PT degree and knowledge base. Then identify what you love about your job. What challenges you, and do you like that challenge? Look at other opportunities and talk to those individuals in those areas. Thanks for your insight, Calista! Want to get a free month with your subscription to PhysicalTherapy.com? Use the code NCPTBONUS13 when you check out!